Part two of our "Behind the Scenes" series takes an in depth look at our brand new Spray Shop. 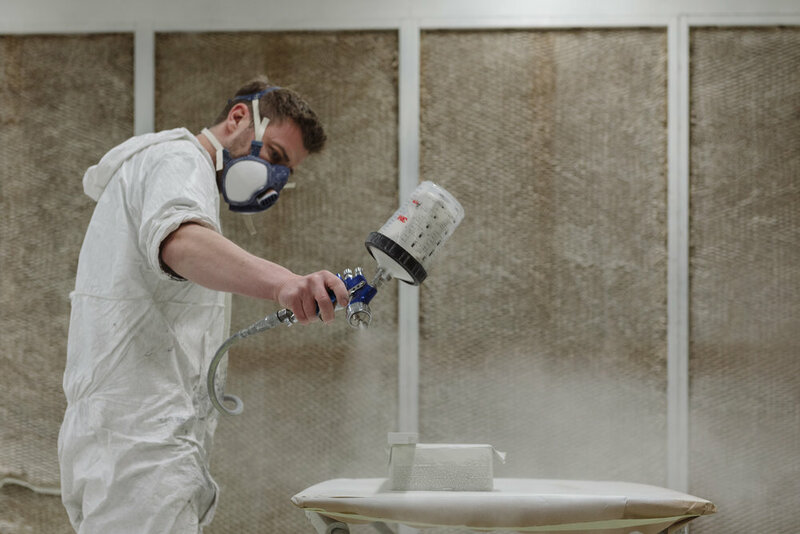 There have been improvements across the board following our move, but the difference between the two sites is most striking in our spray shop and finishes department. Custom designed to increase both our capability in both size and quality, our self-contained spray shop consists of four spraying booths, one of which measures at 6x6 metres, and represents a significant increase in size when compared to our two smaller booths in Great Glen. The facility has its own dedicated extraction system with the size and space necessary to cater for a wide range of manufactured products. With two drying rooms and space for storage and packaging - our new spray shop has completely modernised our approach to this element of our business, with new methods and equipment to improve both our capacity and quality. With production at our new HQ in full swing, many bespoke products have been painted, lacquered, and finished with precision and style in these new booths and we are delighted with the end products so far.